Baca and Hernandez pose at last week’s presser. 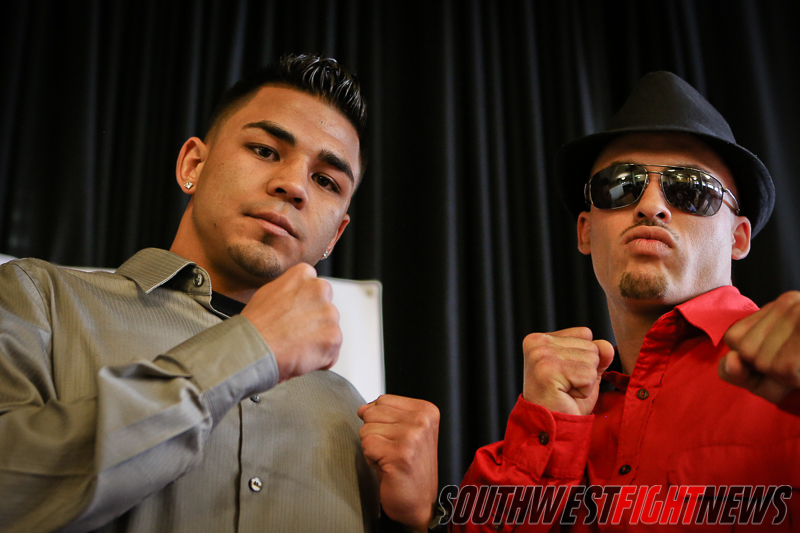 During last week’s Warehouse Rumble 3 press conference Albuquerque boxer Matthew Baca asked Yordan Hernandez to remove his sunglasses during their staredown pose for the media. Hernandez would not heed the request or even acknowledge it. “I feel that’s a sign of disrespect,” says Baca (2-0) who in facing Hernandez (2-0), this Friday night at the Wool Warehouse, will for the first time be in a ring with an opponent that holds at least one victory. The first two opponents of Baca’s career were each making their professional debuts. The two men previously served as sparring partners but when asked about the result of the sparring sessions neither one provided an answer when asked as to which fighter got the best of the other. They instead took the classy approach and identified the sparring as a helpful tool to sharpen their own skills. Hernandez, 10 years the elder of 19-year-old Baca, is a very good techincal fighter and many feel that this might be too big of a leap in competition for Baca who is signed to the top boxing promotion in New Mexico, Fresquez Productions. Baca’s confidence and skills however should be not be questioned and the feeling of being disrespected in public has lit a fire never before seen in him as a professional.